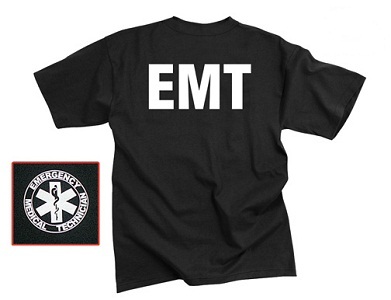 This black EMT T-Shirt is constructed of a 60% Cotton and 40% Polyester blend for a soft comfortable fitting t-shirt. This t-shirt has the word "EMT" printed on the back of the shirt and the EMT logo on the front of the shirt. These t-shirts are great to wear on those warm days. Buy your Black EMT T-Shirt today..